Brisk refreshment in the Italian style. Nice fruity flavours too. All round good guy. Lots of Sauv pep but doesn’t hit you over the head. Worth exploring for house wine, especially come spring when local asparagus hits the stores. Bright, lively, cheerful red that says gulp me. Shades of Valpolicella. Another local in the bistro style – bring on the food, and a second bottle. Vineland Estates 07 Cabernet Franc, Niagara 594127 $12.95 Lightish, with a real friendly feeling. A touch sweet but the vitality carries the show. An easy red that could work for fans of Yellow Tail. Wonderful local expressions that would not be out of place in a French restaurant. Good old-fashioned red wine flavours – earthy, rustic and interesting. Excellent food partners. Seriously rustic and mouth puckering. Not for the Aussie Shiraz fan. But if you appreciate honest, country wines with a feeling of place you may join me in loving this guy. This wine style is becoming rare in this era of smoothness, but there’s no better partner for everyday foods. A lovely hit of France for less than ten dollars. SEMI–SWEET SPARKLING: This style is great for daytime holiday drinking, family events and whenever… My favourite – big time, is Peller Estates Ice Cuvee Rosé. Sparkling with a splash of Icewine. A bit pricy but sure to win your heart. Yummmmm! 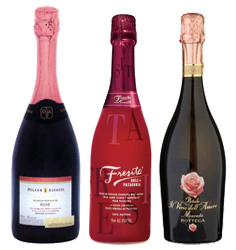 Staying with the rose colour, check out the delicious strawberry-flavoured, low alcohol sparkling from Chile called Fresita. Perfect for brunch, or to celebrate whatever is rocking your world. Even lower in alcohol is Bottega Moscato from Italy. It’s sweet and sparkling, light and refreshing and only 6% alcohol. Gorgeous Muscat flavours that will make you think of summertime in the garden.